Mice lacking Akt2 have a normal body mass, but display a profound diabetic phenotype, indicating that Akt2 plays a key role in signal transduction downstream of the insulin receptor. Mice lacking Akt2 show worse outcome in breast cancer initiated by the large T antigen as well as the neu oncogene. ^ Cheng JQ, Godwin AK, Bellacosa A, Taguchi T, Franke TF, Hamilton TC, Tsichlis PN, Testa JR (November 1992). "AKT2, a putative oncogene encoding a member of a subfamily of protein-serine/threonine kinases, is amplified in human ovarian carcinomas". Proc Natl Acad Sci U S A. 89 (19): 9267–71. doi:10.1073/pnas.89.19.9267. PMC 50107. PMID 1409633. ^ Mitsuuchi Y, Johnson SW, Sonoda G, Tanno S, Golemis EA, Testa JR (September 1999). "Identification of a chromosome 3p14.3-21.1 gene, APPL, encoding an adaptor molecule that interacts with the oncoprotein-serine/threonine kinase AKT2". Oncogene. 18 (35): 4891–8. doi:10.1038/sj.onc.1203080. PMID 10490823. ^ Yuan ZQ, Feldman RI, Sun M, Olashaw NE, Coppola D, Sussman GE, Shelley SA, Nicosia SV, Cheng JQ (August 2002). "Inhibition of JNK by cellular stress- and tumor necrosis factor alpha-induced AKT2 through activation of the NF kappa B pathway in human epithelial Cells". J. Biol. Chem. 277 (33): 29973–82. doi:10.1074/jbc.M203636200. PMC 5077224. PMID 12048203. ^ Figueroa C, Tarras S, Taylor J, Vojtek AB (November 2003). "Akt2 negatively regulates assembly of the POSH-MLK-JNK signaling complex". J. Biol. Chem. 278 (48): 47922–7. doi:10.1074/jbc.M307357200. PMID 14504284. ^ Laine J, Künstle G, Obata T, Noguchi M (February 2002). 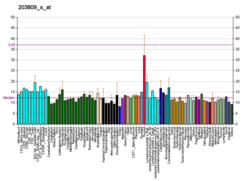 "Differential regulation of Akt kinase isoforms by the members of the TCL1 oncogene family". J. Biol. Chem. 277 (5): 3743–51. doi:10.1074/jbc.M107069200. PMID 11707444. ^ Laine J, Künstle G, Obata T, Sha M, Noguchi M (August 2000). "The protooncogene TCL1 is an Akt kinase coactivator". Mol. Cell. 6 (2): 395–407. doi:10.1016/S1097-2765(00)00039-3. PMID 10983986. Jones PF, Jakubowicz T, Hemmings BA (1992). "Molecular cloning of a second form of rac protein kinase". Cell Regul. 2 (12): 1001–9. doi:10.1091/mbc.2.12.1001. PMC 361900. PMID 1801921. Staal SP (1987). "Molecular cloning of the akt oncogene and its human homologues AKT1 and AKT2: amplification of AKT1 in a primary human gastric adenocarcinoma". Proc. Natl. Acad. Sci. U.S.A. 84 (14): 5034–7. doi:10.1073/pnas.84.14.5034. PMC 305241. PMID 3037531. Cheng JQ, Ruggeri B, Klein WM, Sonoda G, Altomare DA, Watson DK, Testa JR (1996). "Amplification of AKT2 in human pancreatic cells and inhibition of AKT2 expression and tumorigenicity by antisense RNA". Proc. Natl. Acad. Sci. U.S.A. 93 (8): 3636–41. doi:10.1073/pnas.93.8.3636. PMC 39663. PMID 8622988. Meier R, Alessi DR, Cron P, Andjelković M, Hemmings BA (1997). "Mitogenic activation, phosphorylation, and nuclear translocation of protein kinase Bbeta". J. Biol. Chem. 272 (48): 30491–7. doi:10.1074/jbc.272.48.30491. PMID 9374542. Borgatti P, Zauli G, Colamussi ML, Gibellini D, Previati M, Cantley LL, Capitani S (1998). "Extracellular HIV-1 Tat protein activates phosphatidylinositol 3- and Akt/PKB kinases in CD4+ T lymphoblastoid Jurkat cells". Eur. J. Immunol. 27 (11): 2805–11. doi:10.1002/eji.1830271110. PMID 9394803. Walker KS, Deak M, Paterson A, Hudson K, Cohen P, Alessi DR (1998). "Activation of protein kinase B beta and gamma isoforms by insulin in vivo and by 3-phosphoinositide-dependent protein kinase-1 in vitro: comparison with protein kinase B alpha". Biochem. J. 331. ( Pt 1): 299–308. PMC 1219352. PMID 9512493. Joel PB, Smith J, Sturgill TW, Fisher TL, Blenis J, Lannigan DA (1998). "pp90rsk1 regulates estrogen receptor-mediated transcription through phosphorylation of Ser-167". Mol. Cell. Biol. 18 (4): 1978–84. doi:10.1128/mcb.18.4.1978. PMC 121427. PMID 9528769. Delcommenne M, Tan C, Gray V, Rue L, Woodgett J, Dedhar S (1998). "Phosphoinositide-3-OH kinase-dependent regulation of glycogen synthase kinase 3 and protein kinase B/AKT by the integrin-linked kinase". Proc. Natl. Acad. Sci. U.S.A. 95 (19): 11211–6. doi:10.1073/pnas.95.19.11211. PMC 21621. PMID 9736715. Mitsuuchi Y, Johnson SW, Sonoda G, Tanno S, Golemis EA, Testa JR (1999). "Identification of a chromosome 3p14.3-21.1 gene, APPL, encoding an adaptor molecule that interacts with the oncoprotein-serine/threonine kinase AKT2". Oncogene. 18 (35): 4891–8. doi:10.1038/sj.onc.1203080. PMID 10490823. Masure S, Haefner B, Wesselink JJ, Hoefnagel E, Mortier E, Verhasselt P, Tuytelaars A, Gordon R, Richardson A (1999). "Molecular cloning, expression and characterization of the human serine/threonine kinase Akt-3". Eur. J. Biochem. 265 (1): 353–60. doi:10.1046/j.1432-1327.1999.00774.x. PMID 10491192. Meucci O, Fatatis A, Simen AA, Miller RJ (2000). "Expression of CX3CR1 chemokine receptors on neurons and their role in neuronal survival". Proc. Natl. Acad. Sci. U.S.A. 97 (14): 8075–80. doi:10.1073/pnas.090017497. PMC 16672. PMID 10869418. Laine J, Künstle G, Obata T, Sha M, Noguchi M (2000). 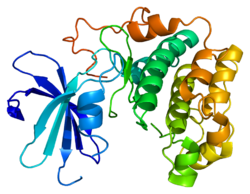 "The protooncogene TCL1 is an Akt kinase coactivator". Mol. Cell. 6 (2): 395–407. doi:10.1016/S1097-2765(00)00039-3. PMID 10983986. Campbell RA, Bhat-Nakshatri P, Patel NM, Constantinidou D, Ali S, Nakshatri H (2001). "Phosphatidylinositol 3-kinase/AKT-mediated activation of estrogen receptor alpha: a new model for anti-estrogen resistance". J. Biol. Chem. 276 (13): 9817–24. doi:10.1074/jbc.M010840200. PMID 11139588. Zauli G, Milani D, Mirandola P, Mazzoni M, Secchiero P, Miscia S, Capitani S (2001). "HIV-1 Tat protein down-regulates CREB transcription factor expression in PC12 neuronal cells through a phosphatidylinositol 3-kinase/AKT/cyclic nucleoside phosphodiesterase pathway". FASEB J. 15 (2): 483–91. doi:10.1096/fj.00-0354com. PMID 11156964. Kapasi AA, Fan S, Singhal PC (2001). "Role of 14-3-3epsilon, c-Myc/Max, and Akt phosphorylation in HIV-1 gp 120-induced mesangial cell proliferation". Am. J. Physiol. Renal Physiol. 280 (2): F333–42. PMID 11208609. Matsumoto M, Ogawa W, Hino Y, Furukawa K, Ono Y, Takahashi M, Ohba M, Kuroki T, Kasuga M (2001). "Inhibition of insulin-induced activation of Akt by a kinase-deficient mutant of the epsilon isozyme of protein kinase C.". J. Biol. Chem. 276 (17): 14400–6. doi:10.1074/jbc.M011093200. PMID 11278835. Brownawell AM, Kops GJ, Macara IG, Burgering BM (2001). "Inhibition of nuclear import by protein kinase B (Akt) regulates the subcellular distribution and activity of the forkhead transcription factor AFX". Mol. Cell. Biol. 21 (10): 3534–46. doi:10.1128/MCB.21.10.3534-3546.2001. PMC 100275. PMID 11313479. Clark DE, Poteet-Smith CE, Smith JA, Lannigan DA (2001). "Rsk2 allosterically activates estrogen receptor alpha by docking to the hormone-binding domain". EMBO J. 20 (13): 3484–94. doi:10.1093/emboj/20.13.3484. PMC 125527. PMID 11432835. Chen R, Kim O, Yang J, Sato K, Eisenmann KM, McCarthy J, Chen H, Qiu Y (2001). "Regulation of Akt/PKB activation by tyrosine phosphorylation". J. Biol. Chem. 276 (34): 31858–62. doi:10.1074/jbc.C100271200. PMID 11445557. Human AKT2 genome location and AKT2 gene details page in the UCSC Genome Browser. This page was last edited on 9 April 2019, at 14:01 (UTC).